It’s a Fire/Water type Pokemon. Nintendo and The Pokemon Company have announced a brand new Pokemon – the creature, not the video game – which will be made available via some form of event next year. Voncanion is a Fire and Water type Pokemon, which uses fire and water to create steam within its body, expelling explosive shock waves and boiling steam from the arms on its back. The power is said to be great enough to blow away an entire mountain, gouging out the earth and changing the shape of the land. More importantly, I’m not quite sure how the hell a Fire and Water type Pokemon is even supposed to work- what would it be weak against? Would it be weak against anything? 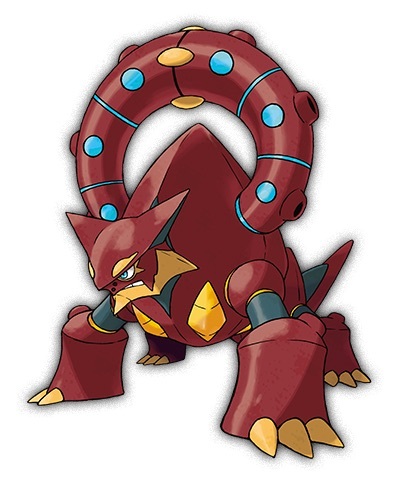 Presumably, Volcanion will be made available for Pokemon X/Y and Pokemon OmegaRuby/AlphaSapphire, both of which are available right now exclusively on the Nintendo 3DS. No new Pokemon game has yet been announced, though Game Freak is widely believed to be working on the seventh entry in the franchise.